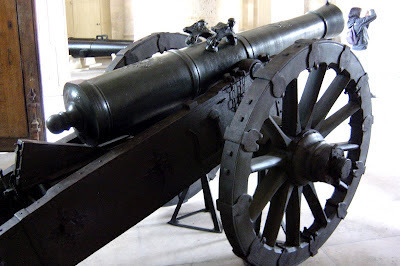 I was leaving Les Invalides when I spotted this gun next to the ticket office. 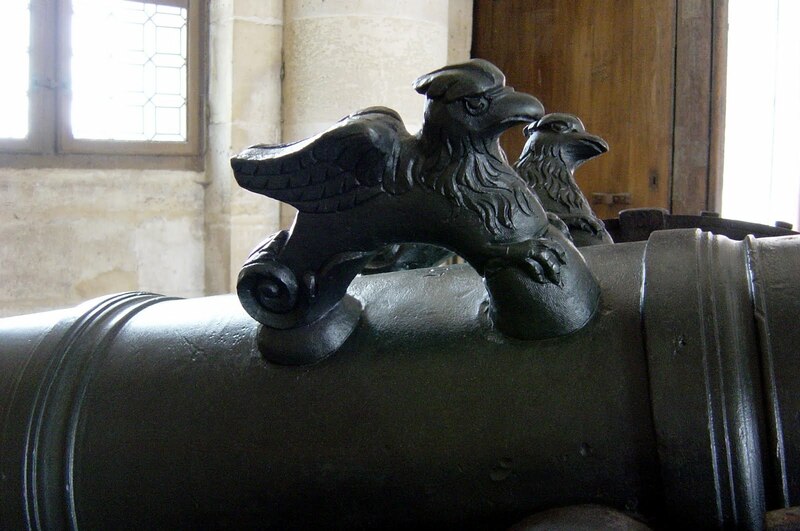 It stuck out because of the griffin trunions which I remembered as being distinctly Prussian. There are hundreds of French barrels throughout the museum but the 18th century ones have dolphin trunions (and, incidentally, each one has a name on the barrel). Because there was no description next to the gun I checked yesterday with Christian Rogge. I hoped it might be a 12pdr from the SYW. Sadly I was wrong, but not by much. The gun is a Prussian ‘heavy’ 12-pounder Brummer [Growler]. Barrel design is 1761. 22 shots long, or approximately 251 cm. long. These pieces did see service late during the SYW, but not this one. 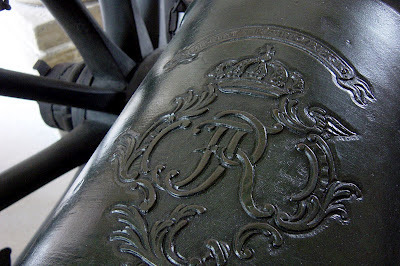 The barrel was cast in 1780. It has a rounded button whereas the SYW ones had pine-cone shaped buttons. The carriage is M1774. The SYW carriages looked like the one Christian recently illustrated with the Beauvry 3-pounder. The Brummers fielded at the battle of Leuthen were even more heavy 24 and 26 shots barrels (273,6 and 296,4 cm) than this one. This Paris piece was probably captured in the Revolutionary Wars. They were used until 1796 and disbanded thereafter. They did not take to the field in 1806. Standing next to the gun you realise quite what an enormous beast she is. She is raised about 4" off the floor on metal supports but even so she ouzes power and threat. I'd have thought she would have needed at least six horses to drag her around on the flat and up any sort of incline, perhaps extra help. 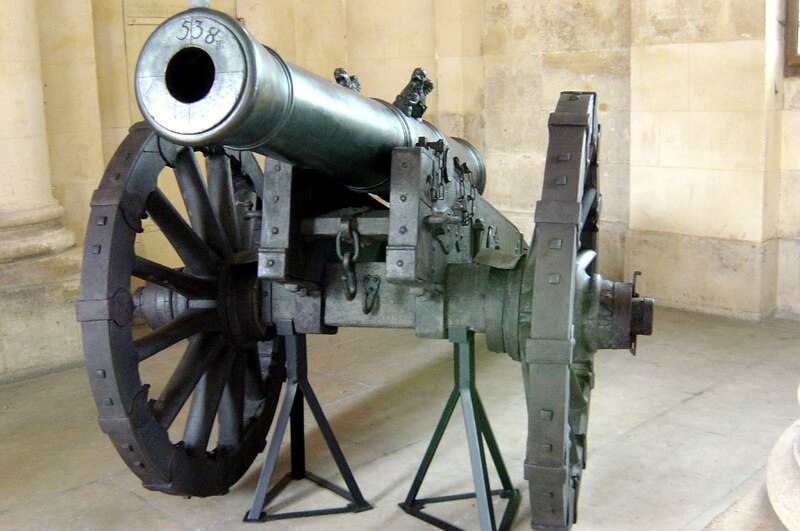 If you go to Les Invalides, you will find her sitting un-noticed by the ticket office. Nice photos of the gun. I saw it myself two summers ago, quite impressive. The rows upon rows of bronze guns in the courtyard were a treat to see as well. And the uniforms and standards and drums and racks and racks of firearms and white arms, and all the rest. A spectacular museum. It is one of the best military museums in the world. But I wanted to go into the Napoleon III rooms as well but, exceptionally, they were all closed on the one day I visited. That is the only downside - they close rooms without warning anyone or putting a note on the website.